Have you ever heard the phrase, “The rich get richer while the poor get poorer”? If you do, this is the phenomenon and the work of success cycle. If you want to be successful and achieve amazing results in life, you must leverage the success cycle to build bigger success. No matter what you are trying to accomplish in life, the first step to achieving the result you desire is the most difficult. Just like if you want to build a blog and earn $1,000 from it each month, the first sale from zero to $100 is the most difficult. However, once you got a breakthrough, things will become easier. After you have made your first $100, earning your next $100 is not as difficult as it seems. Somehow, you have done it before and you just need to repeat or double the effort to earn $200, right? The same thing is happening in every area of your life. The first step to achieving whatever goals you desire is the most challenging and tough. But once you managed to produce some successes, things will become easier. My friend, the principle of momentum is at work. Newton’s First Law states that an object in motion stays in motion and an object at rest will stay at rest. The same principle can be applied to your business, career, and life. If you are moving and gaining ground, you are likely to keep reaping the rewards and keep moving forward. On the other hand, if you are stuck, highly likely, you are going to remain stuck and going nowhere. Unless you do something and pour in serious effort, things are going to remain the same. This is why the rich tend to get richer while the poor become poorer. I love the way how Tony Robbins explains the success cycle. He said that we all have a certain belief and a certain potential in us. And because of what we choose to believe, we take action according to our potential. And as we take action and do something, we will get results. Whether it is a good result, a bad one, or no result, it is an outcome. And our outcome will affect our beliefs again. Take a look at the picture. This is how the success cycle works. We all have been raised and nurtured in such a way that we have formed a certain set of beliefs within us. We believe that there are things that we can do. And we also believe that there are certain things that we cannot do. And our beliefs greatly impact how we live our lives. Highly successful people like Elon Musk believes that he has the potential to change the way human lives, and he believe that colonizing Mars is possible. For most people, they don’t believe that going to the Moon can be something like a leisure travel, let alone colonizing Mars. As you can see, your beliefs shape your life. Whatever you choose to believe, you will do and act in a certain way. Your action will always be in sync with your beliefs. The answer is unlimited. Regardless of your circumstances and situations, we all possess the same unlimited potential to make a positive change and impact in life. The problem is that most people are not living to their true potential. Imagine how you have gone through last year. Did you do your best? Did the results you get portrait your potential? If you are setting the same last year goals this year, it says something about you; that you are not living to your potential and you did not do your best. Our beliefs determine our potential. And our potential will determine what we do in life. Your potential will affect your action. When you believe that you have little potential to make things happen, you will take very little action. On the contrary, if you believe that you are truly destined for big success and that whatever business you venture into turns to gold, trust me, you will do whatever it takes to start a business and make it a stellar success. The problem is that most people don’t truly believe in themselves. They say that they want to be successful and they believe that they can do it, however, what they say and what they truly believe are often two different things. The majority of us is not taking enough action to make our dreams a reality because we don’t really believe that we can be successful. And this affects our potential, and thus, our actions. My friend, if you TRULY, 100% believe that you are lucky and you are going to win the lottery tonight, will you go and buy yourself a ticket? Yes, of course, you will. You’re going to hit the jackpot, guarantee, so what’s stopping you from buying the ticket, right? Now, if you don’t believe that you stand a chance to win, you will not bother buying the ticket. It all starts with what you believe. And hence, your beliefs will affect your actions. Elon Musk truly believes that it is possible for interstellar travel and he is certain that living on Mars is possible. That is why he acted. The same goes for your dreams and goals. When you don’t believe that you are able to achieve them, you will never do anything about them. After you have taken some form of actions, you will receive a report card, your results. Whether you achieve success, fail, or did not receive any result, it is still a result that you must accept. And your results are going to affect your beliefs. For example, when I was in the secondary school, I scored my math with flying colors, and that led me to believe that my math is good and I’m gifted with math. My math score was the result. And the result led me to build stronger belief that I’m good at math. Did you see how things work here? If you make a poor decision in stock investment and you lost most of your money there, it can lead you to believe that stocks stink and you simply don’t have what it takes to become a great investor. When you build an online business but it did not work out, it can lead you to believe that you don’t have the skills or that internet business simply doesn’t work. Your results can affect your beliefs. And your beliefs influence your potential, which determines your actions. And again, your actions lead to the results you get. This is how success works. This is why the rich get richer and the poor get poorer. This is how successful people continue to achieve more success and why the unsuccessful continue to live in mediocrity. Can you see how the success cycle works right now? What you believe –> you have the potential and maybe you can do it –> you put in some effort –> receive small positive results –> have confidence and build stronger beliefs –> exert more potential –> take more actions –> receive even better results –> continue on to build more success. 1. Start small, get positive results, build your confidence, and strengthen your beliefs. Change is necessary, but that doesn’t mean that you should do everything all in one go. You can always start small and grow. We are wired to resist change. And when you try to do something too drastic and too much, it will backfire and you fall back to your original state. What you have to do is to take small actions that will give you positive results. When you receive positive results and you see small successes, you gain the confidence and momentum. As a result, you started to see the possibility that you can do it. This strengthens and builds your belief system. And when you gain stronger belief, you will tap into higher potential and take more action. And with more action comes more and better results. And it keeps going. This is why you should always start small. And don’t get me wrong. I’m not saying that you should dream small or even try to set small goals. I’m saying that you should start small with tiny actions. Rome was not built in a day, my friend. Apple did not turn out to be a multi-billion company overnight and Elon Musk did not start with Tesla and SpaceX straight from the beginning. 2. Celebrate your progress no matter how small it is. The next thing you can do to make the success cycle to work for you is to celebrate your progress no matter how small it is. Please read correctly, I’m saying that you should celebrate your progress, not just your victories. Celebrating your wins and victories are important, but so is the progress that you have made. Most people know that they should celebrate their wins, but most have no idea that they should also celebrate their progress. As long as you have taken some actions and make progress, you should celebrate. For instance, I celebrate every time I completed a task. I give praise to myself that I followed my plan and acted on it. I give a pat on my back after I wrote my articles. I tell myself that I have made progress, and I’m getting myself closer to my goals and dreams. This makes me feel good and that I want to take more action or continue to take action again the next day. So don’t just celebrate your wins, celebrate your progress. 3. Commit to learn and always improve for better results. When you first start something new, the learning curve is steep and everything can seem difficult to you. However, as you learn, grow, and do more of it, things become easier and you are able to produce better results. This is how successful people achieve extraordinary results in their lives. They commit to constant and never-ending improvement. They do their best to learn, improve, and grow their skills as much as possible. In the sports industry, professional athletes train every single day. They know that the more they train, the better they become, and the better results they will get. And when they win or play a better game, their level of confidence will soar, which makes them train even harder. If you have no idea how to build a successful internet business, things will be difficult. You may face a lot of roadblocks and you have no idea where to start. On the other, if you attend a workshop, read a book, or have someone to guide you on your journey, things will be easier. When you see yourself getting small positive results, you feel good and this strengthens your beliefs. You tell yourself that you can do it and you take massive action, producing even more successes. Therefore, commit to learn and always improve. 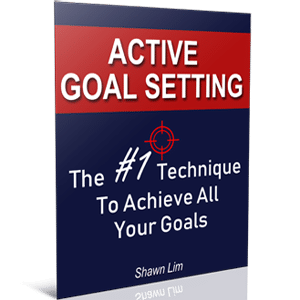 If you have no idea where to start or how to achieve your goals, I strongly suggest you watch this video from John Assaraf where he explains how goal setting works and how you can achieve what you truly want in your life. 4. Condition yourself to believe that you have huge potential to achieve greater success. Read more books related to your industry or personal development books. Want to know what books to read? Check out my personal recommendation here. Talk, network, and mix with other successful people so that their success mentality can influence you. Study and read the biographies of successful people. When you do so, it strengthens your beliefs that if they can do it, so can you. Remember what you have just learned today. Make good use of the success cycle and LEVERAGE on it to build better success, not against you. You can always build stronger beliefs, take not just more action, but right action to produce better results, and always celebrate your progress. I always believe that success is not an accident, but it is engineered. We can decide how we want to live our lives and what kind of results we want. If we are willing to work for what we want, there is nothing that can stop us. Thus, use the success cycle and build the life that you have been dreamed about for so long. Before you go, if you like this article, remember to share it with your friends. And let me know what you think in the comment section below. Cheers.